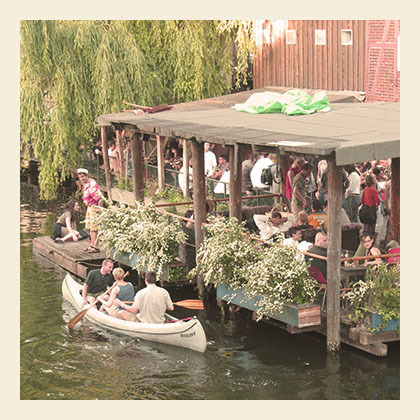 Closeby the EastSeven Berlin Hostel you´ll find the Kulturbrauerei, a former beer brewery which now stands for diverse range of cultural events during the year. One of our favorite Christmas markets will be held here, every year. The romantic world of the Lucia Christmas Market invites you to the Kulturbrauerei. The “Lucia Christmas Market“ takes place in the outdoor space in the two courtyards of the Kulturbrauerei in Berlin’s Prenzlauer Berg district. This beautiful building complex is home to the Lucia Christmas Market. With its picturesque setting, this market offers a very charming and romantic atmosphere and has become very popular with families. It offers a daily cultural program for everbody, on weekend afternoons for kids and invites the grown-ups to meet for a hot mulled red (and white) wine „Glühwein or Glög“. Named after Lucia, the Nordic goddess of light, the market is dedicated to the Scandinavian countries. Lucia Christmas Market at the Kulturbrauerei.